Stillbirth is defined as the birth of a viable baby without signs of life. They account for more than 2.5 million intrauterine deaths per year worldwide and are associated with a number of risk factors, the most important of which are maternal and placental factors. Autopsy provides information that may be of use in determining time since death, gestational age of the fetus, mode of death, cause of fetal demise, and the likelihood of recurrence. The format of the autopsy is guided by parental consent, but even when consent is limited, valuable information may be obtained by careful consideration of antemortem test results, imaging, and genetic testing. Where there is a delay between death and delivery, fetuses are affected by maceration, which may increase the technical complexity of the autopsy and impart a number of artifactual changes, which should not be misinterpreted as genuine pathology. The most common pathologies encountered at autopsy are placental abnormalities, changes related to maternal disorders, malformations, and central nervous system pathology. Stillbirth (Definition) Act 1992 Section 1(1). http://www.legislation.gov.uk/ukpga/1992/29/pdfs/ukpga_19920029_en.pdf. World Health Organisation. Maternal, newborn and adolescent health: stillbirths. 2014. Available at http://www.who.int/maternal_child_adolescent/epidemiology/stillbirth/en/. Accessed 22 Dec 2014. World Health Organisation. Department of Reproductive Health and Research. Policy brief: national, regional and worldwide estimates of stillbirth rates in 2009 with trends since 1995. WHO/RHR/11.03 (2011). Available at http://whqlibdoc.who.int/hq/2011/WHO_RHR_11.03_eng.pdf?ua=1. Accessed 22 Dec 2014. Office for National Statistics. Statistical bulletin: births in England and Wales, 2013 (16 July 2014). Available at: http://www.ons.gov.uk/ons/dcp171778_371129.pdf. Accessed 7 Dec 2014. The Royal College of Pathologists. Guidelines on autopsy practice: scenario 9: stillborn infant (singleton). Royal College of Pathologists June 2006. 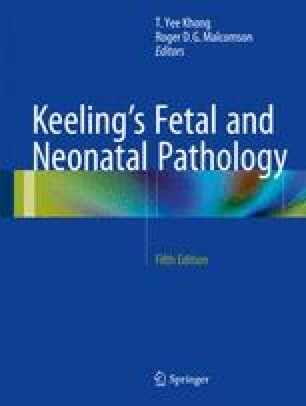 Available at: http://www.rcpath.org/NR/rdonlyres/E50F0159-6EC5-430D-91F3-2AEDFACEE3DC/0/G001AutopsyStillbirthsJun06.pdf. Accessed 7 Dec 2014. Public Health England. Health Protection – Guidance: Chlamydophila abortus (11 September 2008). Available at https://www.gov.uk/chlamydophila-abortus. Accessed 22 Dec 2014.